Paris Dixon, 5, and London Dixon, 8, of Bowie; Rickelle Ricks, 6, Zion Beard, 14, of D.C., and Damari Herald, 15, of D.C., were killed when their SUV ran off the highway Saturday morning. MORNINGSIDE, Md. — Brokenhearted parents, grandparents, great grandparents and children gathered at sunset to pray and release bouquets of colorful balloons to remember five children — all related — who were killed in a Saturday morning single-car crash. “We are a family, 100 percent. We’re going to stay that way. Our angels are going to look over us at all times,” one woman, who described herself as a great aunt, told the mourners. “I want them here. I will miss them. I will miss their little, funny ways,” she said. Paris Dixon, 5, and London Dixon, 8, of Bowie; Rickelle Ricks, 6, Zion Beard, 14, of D.C., and Damari Herald, 15, of D.C., were killed when the SUV they were riding in ran off U.S. 301 northbound in Bowie before 5 a.m. Saturday. Police say the children were not properly restrained and were thrown from the vehicle when it struck trees. Two adults were hurt — the driver Dominique Taylor, 32, of Bowie, who is the mother of two of the children and front-seat passenger Cornell Simon, 23, of Oxon Hill. A family member said Simon remains in critical condition while Taylor is recovering. 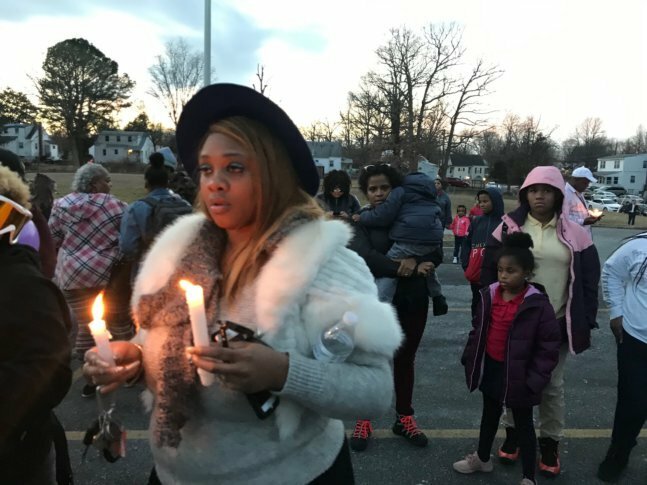 “Look to the person next you … and just give them a big hug … and tell them ‘I love you,'” Pastor Barry Wade of Body of Christ Christian Church of Capitol Heights told mourners. Family members shared brief remembrances of the five lives cut short. Then, as the sun faded on an unusually warm winter day, mourners let go of strings tied to colorful balloons that rose into the gathering darkness of the sky. Ricardo Ricks, grandfather of Rickelle, remembered aloud the time he and his young granddaughter went to see the lights at the National Zoo this past Christmas, followed by an ice show.